How to do Wrap Text in Excel | Fix content in single cell. 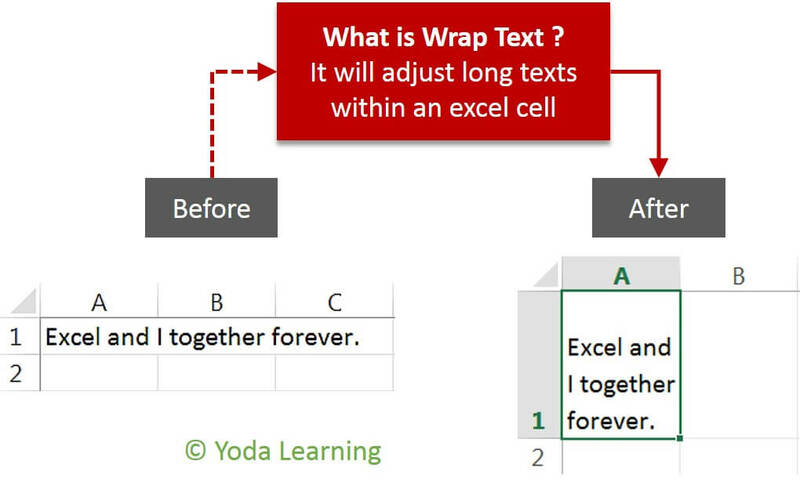 Wrap Text is most known function of excel. There are times when there is difficulty to adjust long texts within an excel cell. When you’ve much text piled up and it should be present in the spreadsheets. Or if you have failed to fit your text in an Excel Cell. 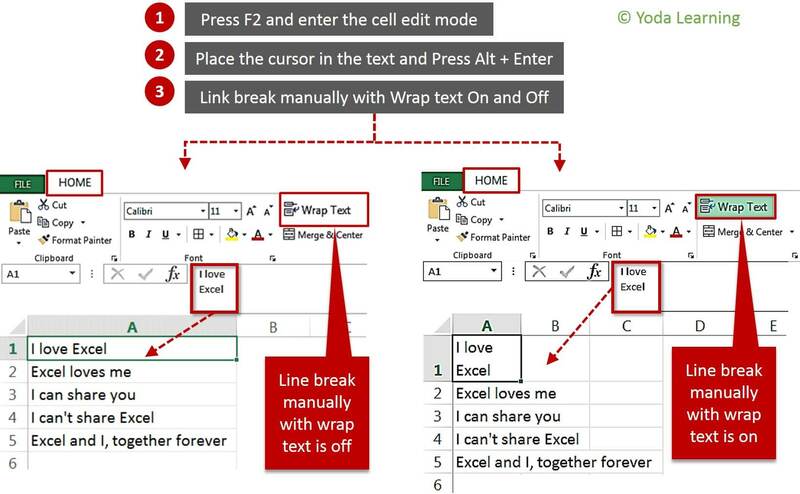 Excel Wrap Text option will help you fit a long text in an excel cell or adjust long texts within an excel cell. Well, what you can do about this is, learn how to make an excel cell expand to fit the text. What are the steps to Wrap Text Cells in Excel? When do you use wrap text? How to wrap text automatically? How to unwrap text in Excel? How to insert a line break manually? How to autofit Fixed row height in Excel? How to Merge and center in Excel? You’ll observe the cell here is wide enough for displaying the value. 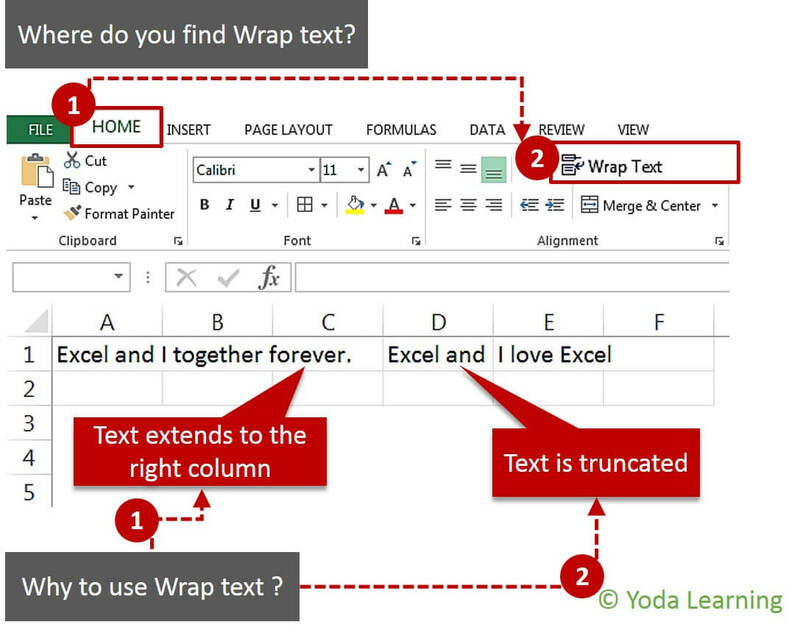 When you want to fit long text in Excel using Wrap Text, Microsoft lets you do this by offering few other ways. The tutorial is all about the Microsoft Excel Wrap Text Feature and also about the quick tips on how to use Wrap Text in Excel wisely. Sometimes, there is a large amount of Data in an Excel Cell and you don’t know how to fit the long text in an Excel Cell. The reason is, the data is too large. During this situation, the two situations are for sure to strike. When the columns towards the right side are empty, you’ll observe that the cell border of the Columns will be extended with long text strings. When there is any data in the adjacent cell at the right. At the cell border, you’ll observe the text string is cut off. In the image, you’ll get to see where to find Excel Wrap Text icon in Excel. The longer text is getting shortened. 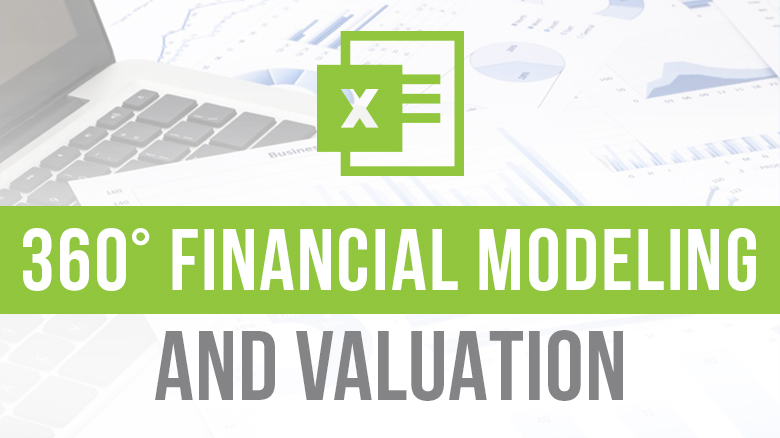 Do you know how to use the Excel Wrap Text Feature? The Excel Wrap Text Feature will help you to display and learn how to fit the long text in Excel using Wrap Text in an individual cell. What happens is, there are times when some texts get lost in the next line. The main advantage is, the text here won’t overflow in the adjacent cell. With “Wrapping Text” you’re able to Wrap the text in Multiple Lines rather than displaying it on one long line. This helps you in avoiding the “Truncated Column effect”. As you can see, the text is overflowing from the Column and getting Truncated towards the right. Which is making the readability of the text a lot easier than before. Also, it makes text adjustments for its printing. 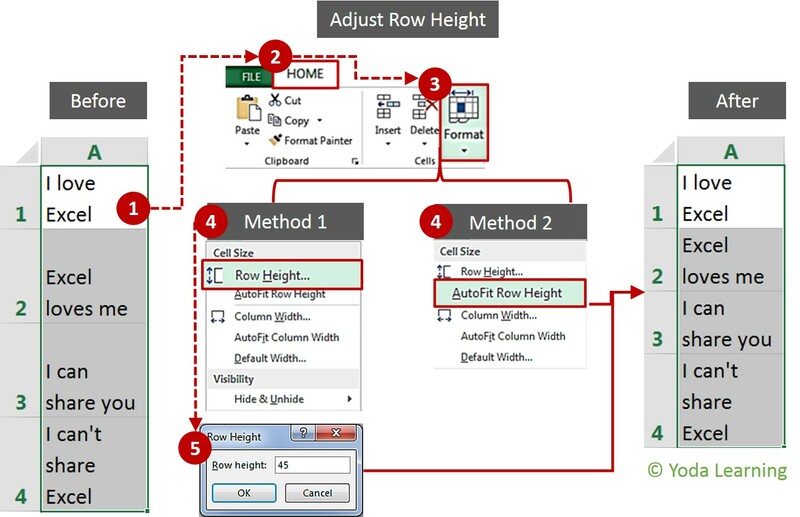 Add on: The main contribution of the Wrap text feature in Excel is that, it helps to retain the main width of the Column in the entire Worksheet. In the image, you’re able to see how a wrapped text looks like in Excel. If you wish to obtain the lengthy text string or see it on Multiple Lines or line of text in cell, you need to select the cell(s) that you wish to Format. Now, you need to turn on the Excel Text Wrap Feature on. Compared to the first method, this will be a tricky and complicated one. It might need few of your Extra clicks but with this is wrapping text would become easy. Cell Formatting: Here will bargain you some time. If you wish to bring changes in the Cell Formatting at a time, wrap up text option will be one change. Important Tip: When you observe that the Wrap Text Checkbox is Solid-filled. 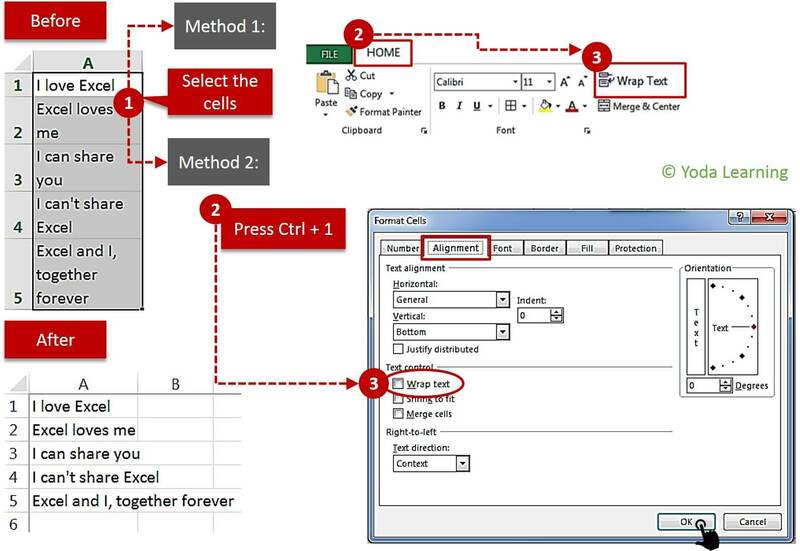 This indicates that setting the selected Cells has different Text Wrap. Result: It doesn’t matter what method you’re using. The data in the selected cells wraps to fit the column width. This is why, on changing the column width, text wrapping will adjust automatically. When you insert a line break it turns on the Wrap Text Option automatically. Whereas when you enter the line break manually, this will stick at the same place even when the Column is made wider. When you turn off the Text Wrapping, the data will be displayed in one line in a cell. Also, If you wish to see the line breaks inserted, you’ll be able to find these in the Formula Bar. In the image, you’ll be able to observe both the situations. A Line break is entered after the word ‘love”. If you have merged Cells, wrap text won’t work. Suppose, if your cell doesn’t show Wrap Text then you’ll need to adjust the Row Height. Also, Steps to adjust the Row Height are explain above. Excel’s Wrap Text feature isn’t flexible when working with the merged cells. So, you must decide which feature will work best and for the particular Worksheet. Using the merge Cells Option, you’ll be able to display the whole text string in the columns. You’ll need to make the Column Wider. Do not wrap a cell(s) that is already wide enough to display its contents. The reason is, if you try to, nothing will happen to the text. In case, if you resize the Column for the further entries, the column might become too narrow in size. It becomes difficult to adjust the longer entries in this. Toggle the Excel Wrap Text Button off and then on again, just in case, if you wish to fit a long text in Excel using wrap text.